(31x28) Vintage 70s Mens Polyester Disco Pants! Funktacular Dark Green! 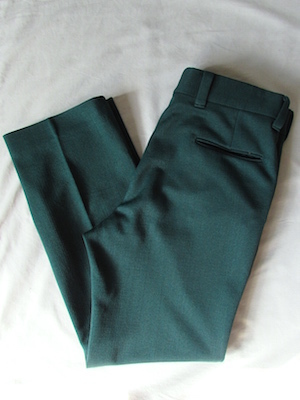 Home > 1970s Disco Clothing > All Disco Clothes > (31x28) Vintage 70s Mens Polyester Disco Pants! Funktacular Dark Green! 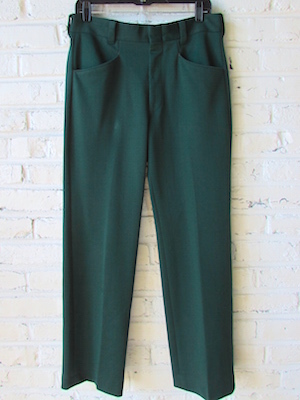 Dance the night away in these groovy dark green vintage 1970s mens polyester disco pants! Pants have extra long and extra wide belt loops. Closes in the front with a hidden tab closure. 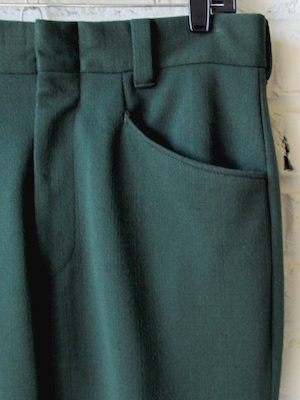 Four classic pockets with one back pocket with a button closure. Tagged by Levis Pantela. No material tag, but feels like 100% polyester. Condition: Very Good. Has what appears to be a tiny pull on the lower right pant leg. Still a great pair of pants for your disco party!